“Portage Island Cliff No. 13” was an exercise in color and shapes. I started with a medium gray sanded paper, just as I have with the last couple of paintings in this series. Overall, the gray neutralizes the color in the painting a bit, resulting in a softer, overcast look. Using soft vine charcoal I sketched in the five basic shapes in the scene: the foreground water, the cliff face, the clear area, the background woods, and the far background foothills. That left the sky as the sixth shape. I tried to see only the large shapes and ignore objects, such as the trees. Next, I tried to identify the average color of each shape, leaning toward slightly dark and slightly neutral or gray. I lightly applied pastel to each shape, using only the average colors. I kept the strokes light so the “tooth” or texture of the paper would have room for more layers of pastel. When I was done, the whole painting was covered with a thin layer of color, though the paper color still showed through in some areas. Finally, I lightly added more layers of colors to vary the greens and blues that made most of the painting. I gradually added some detail areas at the main focal points I kept most of the edges loose and not sharply defined. I’d like to try this same technique on white paper so the colors would look brighter. It would be interesting to compare the amount of difference using exactly the same colors and the same scene. Filed under Blog. 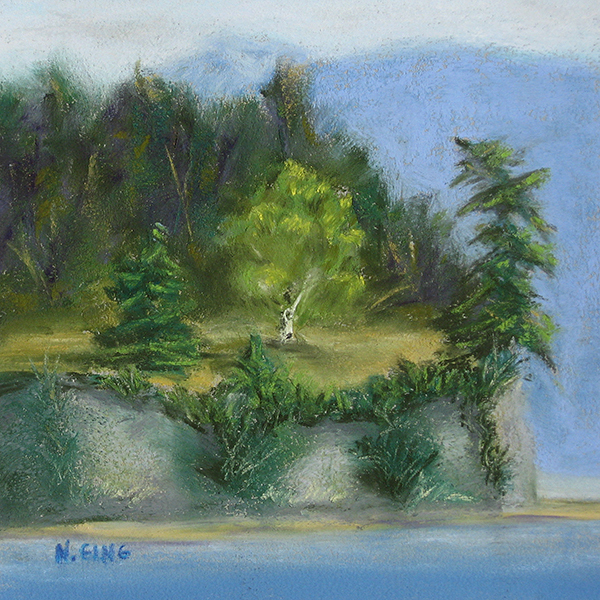 Tagged 6x6 series, art process, landscapes, Nancy Ging, Pacific Northwest, pastel paintings, Portage Island Cliff 6x6 series, seascape, small wonders, soft pastels.